Is it cool to like Billy Joel yet? The singer-songwriter has certainly been around long enough (38 years). He’s had more than enough hit singles (53). And, crucially, he’s been misunderstood in his time – despite a Grammy-studded recording career, the rock press always showed him a certain degree of critical disdain. Take this year’s 30th anniversary re-release of 1977’s multi-platinum The Stranger. A Rolling Stone reviewer heaped plaudits and stars upon it, even as he described the “glistening dollops of Broadway schmaltz”. You get the feeling Joel is a little cynical about his mantle of pop icon. Of course, he’s never been entirely happy with tags like balladeer, which critics were eager to slap on after the runaway success of piano-led songs like “Just the Way You Are”. In fact, he did have much more hard-edged material, most notably 1980’s Glass Houses, said to be a reaction to the perception of him as “soft-rock”. To illustrate the very antithesis this was to his being, Joel describes how he used to pour lighter fluid on his “piece of junk upright and half the keys didn’t work”, turn off the lights, and set the keys on fire in an homage to Hendrix-style rock’n’roll. Joel in fact did grow up getting piano lessons from a Julliard-trained tutor and, on occasion, noted American pianist Morton Estrin. He spent his school years in Hicksville, New York – a town so small it’s officially a hamlet – and played piano in a couple of Long Island bands before striking out solo. 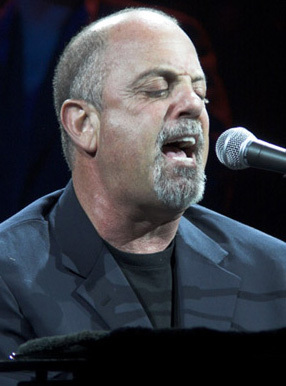 His first album was 1971’s Cold Spring Harbor, but his breakthrough work was Piano Man, two years later and based on his experiences as the piano player in a hotel bar. “I actually wanted to be a songwriter. I wanted to just write songs and have other people do them, and then it ended up that I was the guy doing them,” he says. Based on advice from his label, Joel ended up recording the songs he’d written, and then going on tour to promote the album. As it turned out, the 70s were the era of the singer-songwriter, and ushered in Joel’s turn as one of America’s most successful musicians, among peers that included Carole King, Cat Stevens and Elton John, who Joel still tours with today. “If I could do it all again, I would probably have put out less albums and had more good material,” he adds. “I want to be a better composer. To this day, I’m still trying to learn how to write thematic instrumental music.” Joel did release an album of classical compositions, Fantasies and Delusions, which topped the classical charts in 2001. There’s a certain underdog tone to some of what Joel says, but the guy is a certified multi-platinum artist for a simple reason. People get him. His lyrics cover the simple and often ignominious stuff of human experience – “being in love makes you insecure” (“Tell Her About It”) or “the old man next to me, making love to a gin and tonic” (Piano Man).